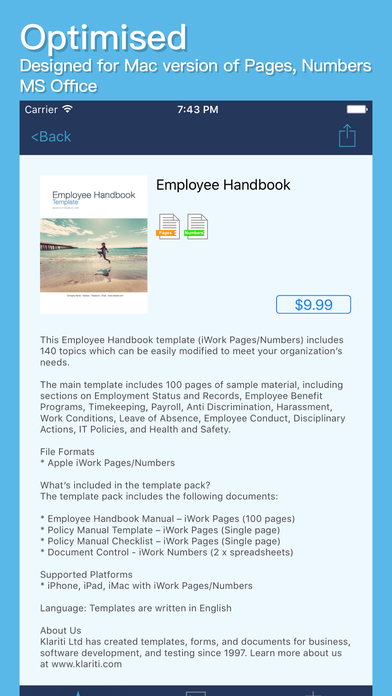 Download the Klariti Store Templates Apple iTunes app, find the MS Office/iWork Pages and Numbers templates you want, and improve your business, technical and marketing documents today. No email registration required. No account required. 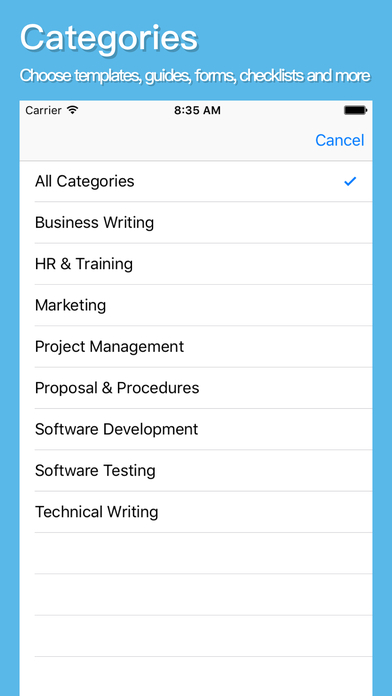 Download the app and browse over 525 templates for Software Development, Software Testing, Project Management, Business Plans, Business Analysis, Proposal Development, White Papers, and other marketing documents. All templates are royalty-free, completely customizable, and ready for immediate download. 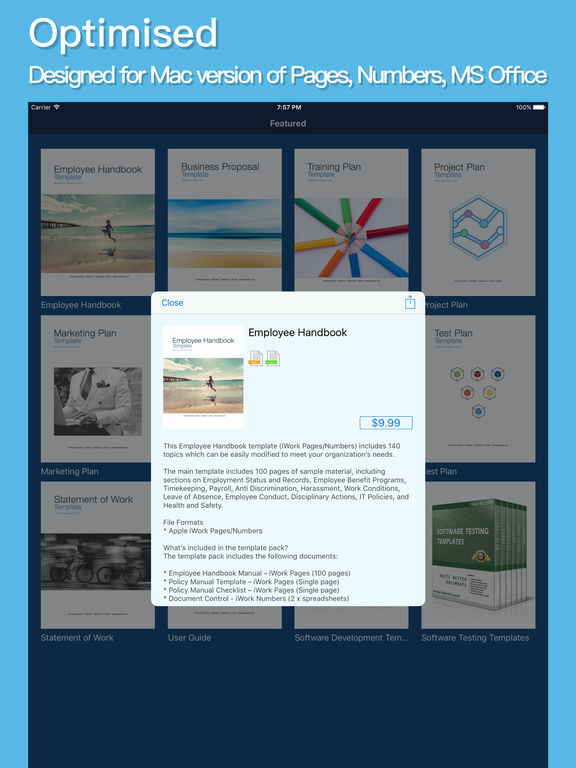 An example of the app when you open one of the products. Looks nice, doesn’t it? The templates are compatibility with Apple iWork (06, 08, 09+) and MS Office 2011 and above. 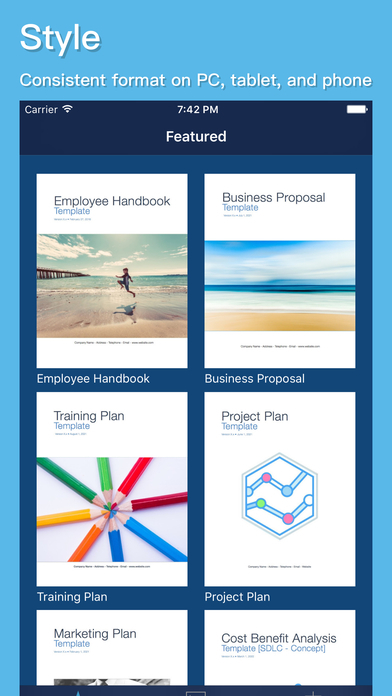 The templates work in Apple iWork (Pages/Numbers) and MS Office (MS Word/Excel). Click the Open button to open the Download page. Copy the templates to Pages, Number, Word or Excel. Then Save your copy. 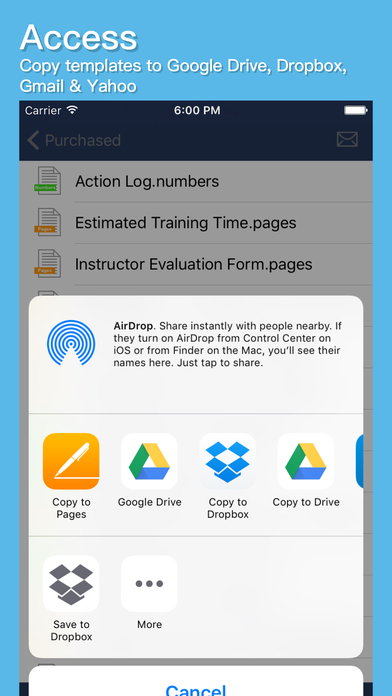 You can also copy them to Google Drive, Dropbox, and email them to your Gmail and Yahoo accounts. Updated weekly! 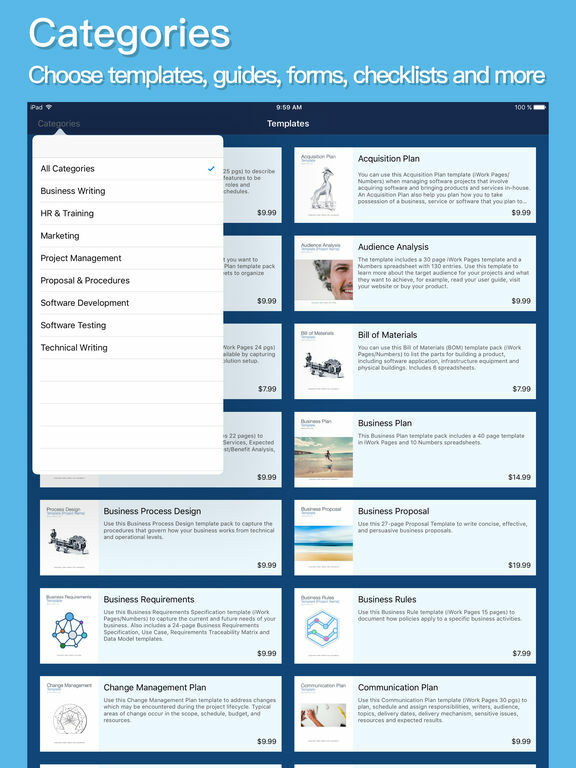 Download the app, browse the store, and select the templates you want. 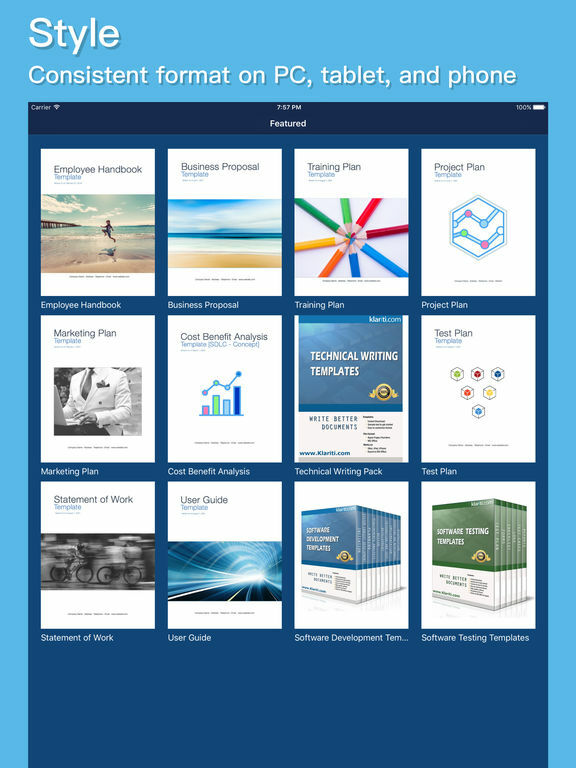 Software Development – Save yourself time and money by downloading over 575 pages of iWork/MS Office templates. Get templates to assist your software developers, test team and technical writers: Bill of Materials, Concept Proposal, Statement of Work, Cost Benefit Analysis, Feasibility Study, Risk Management, Change Management Plan, Verification & Validation Plan, Business, Functional, Software Requirements, Conversion Plan, Database Design, Contingency Plan, Installation Plan, Maintenance Plan, Operations Guide, and Disposition Plan. Software Testing – 50 Pages/Word + 27 Numbers/Excel templates includes Action Items, Change Control, Change Requests, Contract Review, Data Access, Enhancement Request, Error/Quality/Risk Logs, Status Report, Test Case, Test Plan, Test Record, Test Script, Unit Test Plan, User Acceptance Test Plan. 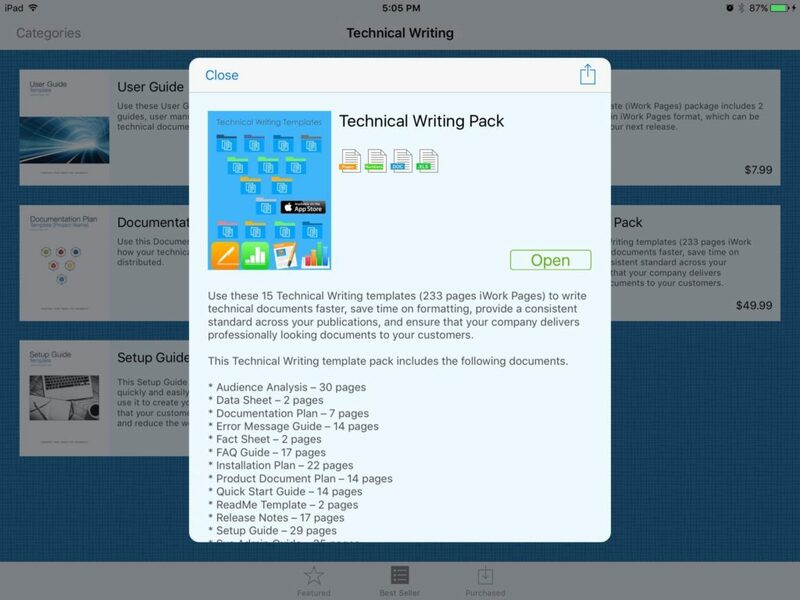 Technical Writing – 15 templates helps write technical documents faster including Documentation Plan, User Guide, Fact Sheets, Error Messages Guide, Release Notes, Setup Guide, System Admin Guide, Use Case, White Papers, Work Instructions. 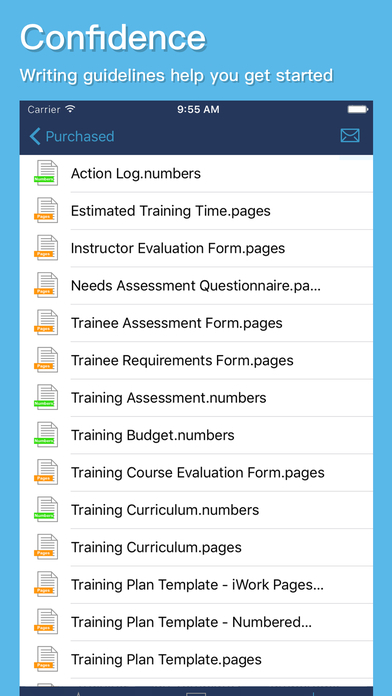 Procedure Writing – includes SOP templates, Guidebook, Log Book, Document Control, Clarifications and spreadsheets. Proposal Development – Request for Proposal, Invitation To Tender, Expression of Interest, Proposal Forms – 25 Excel & Word logs, forms, checklists, and templates. Proposal Template to write business proposal or respond to RFP. Project Management – Includes Work Breakdown Structure spreadsheets, Risk Management Plan, Feasibility Study, Functional Requirements, Implementation Plan, Scope of Work. Klariti Ltd has delivered templates, forms, and checklists since 1997.